Semtech Corporation (Nasdaq: SMTC), a leading supplier of high performance analog and mixed-signal semiconductors and advanced algorithms, announced its next generation LoRa® devices and wireless radio frequency (RF) technology (LoRa Technology) chipsets enabling innovative LPWAN use cases for consumers with its advanced technology. Addressing the need for cost-effective and reliable sensor-to-cloud connectivity in any type of RF environment, the new features and capabilities will significantly improve the performance and capability of Internet of Things (IoT) sensor applications that demand ultra-low power, small form factor and long range wireless connectivity with a shortened product development cycle. 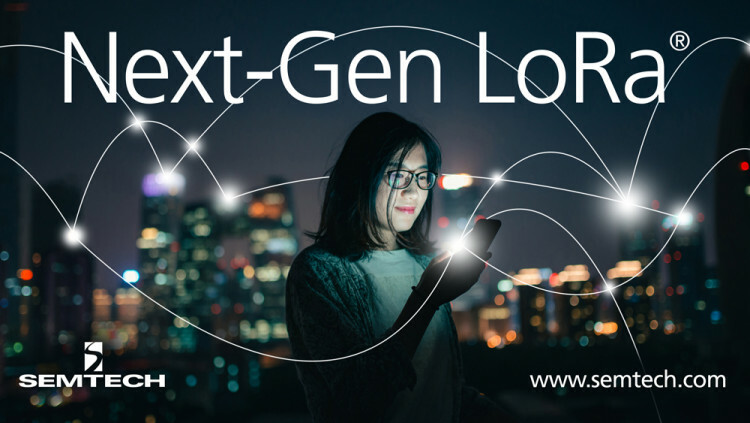 The next generation LoRa radios extends Semtech’s industry leading link budget by 20% with a 50% reduction in receiver current (4.5 mA) and a high power +22 dBm option. This extends battery life of LoRa-based sensors up to 30%, which reduces the frequency of battery replacement. The extended connectivity range, with the ability to reach deep indoor and outdoor sensor locations, will create new markets as different types of verticals integrate LoRa Technology in their IoT applications including healthcare and pharmaceuticals, media and advertising, logistics/shipping, and asset tracking. In addition, the new platform has a command interface that simplifies radio configuration and shortens the development cycle, needing only 10 lines of code to transmit or receive a packet, which will allow users to focus on applications. The small footprint, 45% less than the current generation, is highly configurable to meet different application requirements utilizing the global LoRaWAN open standard. The chipsets also supports FSK modulation to allow compatibility with legacy protocols that are migrating to the LoRaWAN™ open protocol for all the performance benefits LoRa Technology provides. Three new devices, SX1262 (+22dBm), SX1261 (+15dBm) and SX1268 (+22dBm, China frequency bands) are currently sampling to lead customers and partners and will be available in full production in late Q1 2018. Development kits for various regions and associated software will also be available at that time. For more information, visit www.semtech.com/iot. Semtech’s LoRa devices and wireless radio frequency technology is a widely adopted long-range, low-power solution for IoT that gives telecom companies, IoT application makers and system integrators the feature set necessary to deploy low-cost, interoperable IoT networks, gateways, sensors, module products, and IoT services worldwide. IoT networks based on the LoRaWAN™ specification have been deployed in 45 countries and Semtech is a founding member of the LoRa Alliance™, the fastest growing IoT Alliance for Low Power Wide Area Network applications. To learn more about how LoRa enables IoT, visit Semtech’s LoRa site and join the LoRa Community to access free training as well as an online industry catalog showcasing the products you need for building your ideal IoT application. Semtech, the Semtech logo, and LoRa are registered trademarks or service marks, and LoRaWAN is a trademark or service mark, of Semtech Corporation or its affiliates.